A middle-of-the-road liberal (John Adams, 2003, etc.) looks into Ronald Reagan’s soul and concludes that it was great—and that the president was “politically wise, humane, and magnanimous” to boot. Reagan was more radical than conservative, by Diggins’s account. He found inspiration in the life and work of Tom Paine, that little acknowledged founding father; he quoted Paine to the Soviets and hailed the Afghan mujahedeen and Nicaraguan contras as Paine’s rightful heirs. He considered the state to be the source of most evil, though his actions, Diggins writes, made big government inevitable; his dream of an almost stateless society and his sensibility generally “partook of the tragic vision of liberalism.” And, Diggins suggests, Reagan’s religion was less inclined to Christian fundamentalism than to a Jeffersonian deism: “He seemed to offer a Christianity without Christ and the crucifixion, a religion without reference to sin, evil, suffering, or sacrifice.” All in all, Diggins writes, Reagan “was a liberal romantic who opened up the American mind to the full blaze of Emersonian optimism.” For this and many other reasons, not least because Reagan knew his Transcendentalists, Diggins holds that Reagan needs serious attention from intellectual historians, who have largely dismissed him as a nonintellectual. 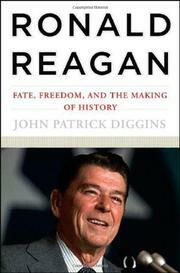 Not so, Diggins counters: Reagan was aware of the nature of his arguments, was well schooled in them. If Diggins has a beef, it is with the unworthy neoconservatives who claim Reagan as their own; Diggins faults Reagan’s view of the Cold War as inaccurate and lacking in complexity, for instance, but clearly favors it to the reckless warmaking of the current administration. “To rescue Reagan from many of today’s so-called Reaganites may help rescue America from the pride of its present follies,” he adds. A significant book, if surely arguable in granting Reagan more depth and ability than most nonbelievers have hitherto suspected.